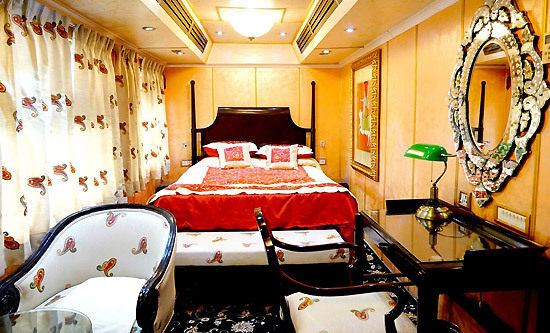 Like the royal opulence of the Indian luxury train, cabins of Palace on Wheels are the epitome of regal pleasures. The train comprise of 14 fully air-conditioned coaches. Each one is unique, with matchless décor adapted from the royal dynasties that once ruled Rajasthan, formerly Rajputana. Even the names are taken from the royal provinces of the state. Fit for royalty, the cabins are not just furnished with amazing décor, there are complete with luxurious comforts. 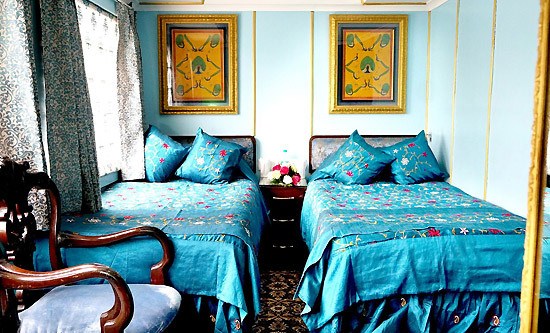 Rich silk fabrics, antique wooden furniture, beautiful artworks add to the opulence. While your comfort is assured with world-class modern facilities. Enjoy the amenities of attached bathroom with posh toiletries, individual temperature control, internet connectivity, electronic safety deposit, telephone, etc. Also, the cabins have the availability of a special attendant called Khidmatgar to cater to your needs.